A small processing unit which can speed up drying of a minimum of 100 kilogram of chilli on a daily basis has been formally handed over to the villagers of Sirarakhong, a small hamlet located about 67 km away from Imphal in Manipur’s Ukhrul district on Thursday. 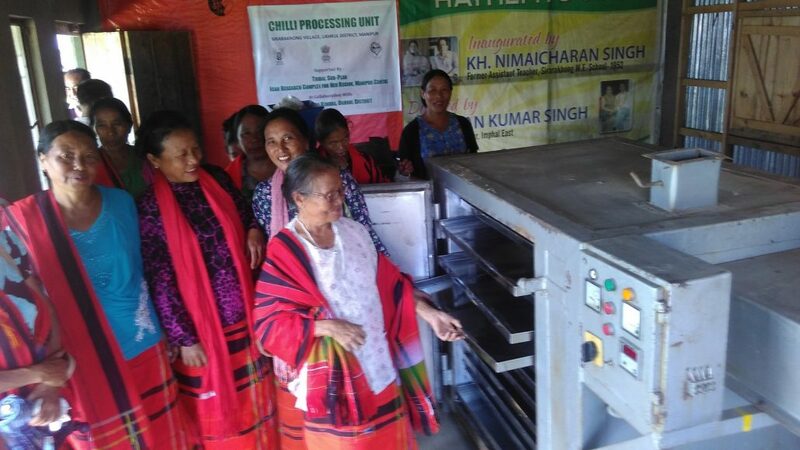 The processing unit costing around Rs 9.5 lakhs was provided by Indian Council of Agricultural Research (ICAR), Manipur centre under its tribal sub-plan scheme considering its requirement in the village through the Sirarakhong Hathei Promotion Committee. The processing unit includes a grinder, a dryer, sealer, sieving and weighing machines. The very small but meaningful formal handing over and taking over function of the processing unit was held on the second day of the ongoing three-day ninth Hathei Phanit (Chilli Festival) in presence of senior scientist Dr Subhra Saikat Roy of ICAR, Manipur centre and headman Wungkhayap Zimik of Sirarakhong village. Sharing his feeling on the occasion, senior scientist Dr Roy appealed to the villagers to make use of the processing unit for the improvement of the village’s economy. Sirarakhong village produces one of the exclusive chilli varieties which has higher ASTA colour value than the Kashmiri chilli in the country, said Dr Roy. Besides having vitamin C, Sirarakhong chilli popularly known as Hathei in local tongue has deep red colouring agent while Kashmiri ones has royal red. Earlier, the second day of the three-day saw honouring of local (Chingai) MLA Khashim Vashum with traditional attire and a basket of chilli. In return the MLA also handed over financial assistance to the festival organizers. According to village headman, the MLA who hails from Tusom, one of the largest rice producing villages in the district also assured inclusion of some development programmes of the village in his constituency’s development activities. The Sirarakhong villagers are also expecting construction of the 10 km long road which connects the village and plantation sites. The State Horticulture Minister has also been approached in developing a permanent cultivation sites considering the State’s organic mission. Presently the chilli is cultivated in the jhum areas of the village which has about 400 houses with a population of more than 2000. Eighty per cent of the population were engaged in the chilli cultivation to produce around 10,000 kilograms of chilli annually. There are eight varieties of chillies including Hathei in Manipur, according to horticulture officials.